What's the best way to get kids excited about wildlife and conservation? Is it to fill them up with science about diet and range and populations? Or can you give them a sense of wildlife wonder with facts about folklore and history? Well not surprisingly scientists working in conservation tend to focus on the science but new research shows that might not be the right approach. Researchers from the University of Birmingham have been conducting experiments with more than 400 school children to test their attitudes to conservation and wildlife. But first they filled them up with facts and in this case facts about magpies. Some kids were given facts from history and folklore, some from science, some from both and a control group got nothing. Well everyone knows them as a species and they're quite divisive. I love them for their smarts and looks but some people can't stand them at all apparently. But they're not a wildlife poster animal like an eagle or a panda. So the kids wouldn't already be invested in their survival. I sat in on an example of the sort of experiment the researchers carried out. First Nigel Hopper from the University of Birmingham read out information about the magpie, in our case all about magpie folklore, and then the children were given a quiz. They were asked lots of questions and in particular whether they thought it was important to protect magpies as a species and why? 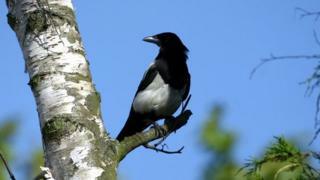 The results showed that students only given information about the folklore of magpies valued that knowledge and further regarded it as a reason to protect the birds. Those only given scientific information though were less likely to think the magpies needed protection. For the scientists this is an interesting result. It reveals something as simple as a story or interesting piece of magpie folklore can do much more to engage the public with their future. And there's no reason to think what works for magpies won't work for other species too. It's a salutary reminder that science isn't always the answer to every conservation issue and with magpies, as the paper notes, the evidence is in black and white.